Columbus, Indiana | ride. travel. live. Columbus, Indiana, is one of America’s supreme built environments, in a rather unlikely place, located 45 minutes south of Indianapolis, Indiana. 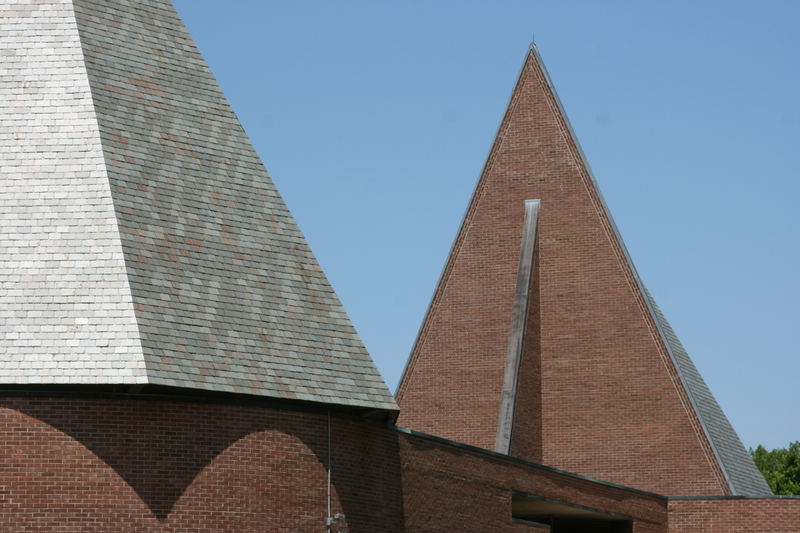 Over the past 70 years, there have been a string of distinguished buildings from the leading architects of the day, starting with the First Christian Church of Eliel Saarinen. In this small town of 44,000 is a treasure trove of civic and religious structures, many of them built in an agreement with the Miller family and their Cummins Foundation, who would pay the architects’ fees in exchange for a commission from their list of architects. The town overall exudes Midwestern conservatism, no doubt a defining feature of Indiana, especially the southern part of the state. I perceived a bit of a Southern flavor as well, given that it’s south of the I-70, and within about an hour of Louisville, Kentucky, and two hours of Cincinnati, Ohio. And it was difficult to find a cup of coffee downtown. I dropped by in mid-summer 2012, complete with oppressive heat and humidity, and crunchy brown lawns. 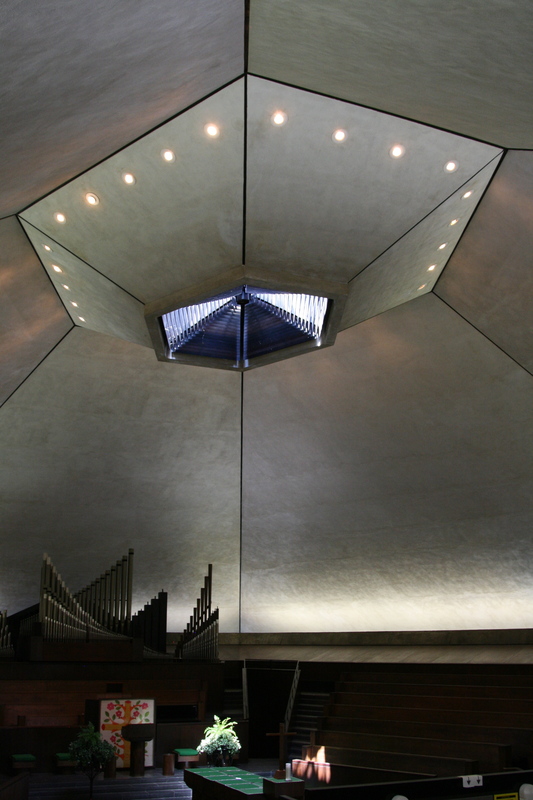 The best of the buildings are the churches, I visited the three ‘historic’ ones, by Saarinen senior, Saarinen junior, and Harry Weese. Each of them is in a different style, and rendered even more amazing by the more recent McHouses nearby, typical of American suburbia. The Saarinens couldn’t be more different in style, and Weese puts a human scale to Brutalist architecture, and is a very underrated architect. 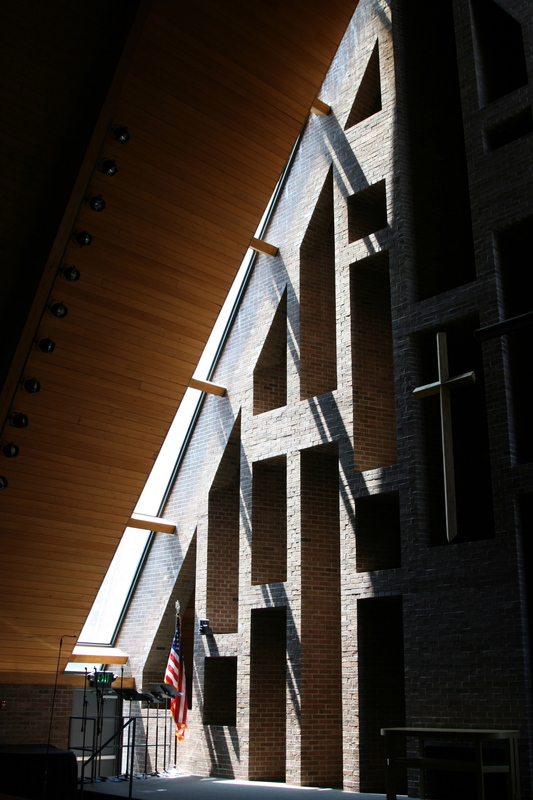 Weese loves concrete and brick, and he did wonders with the First Baptist Church (1965), just as he did with his more recognized works in the DC Metro and Chicago. 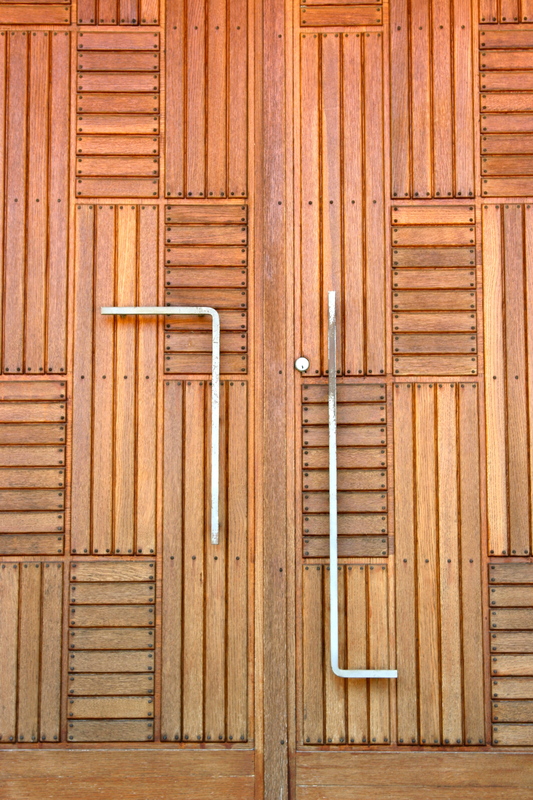 The outside is reductionist, almost windowless, with the clear elements of a church. The interior is a surprisingly warm space, with wood ceilings, and still plenty of natural light filtering into the sanctuaries. 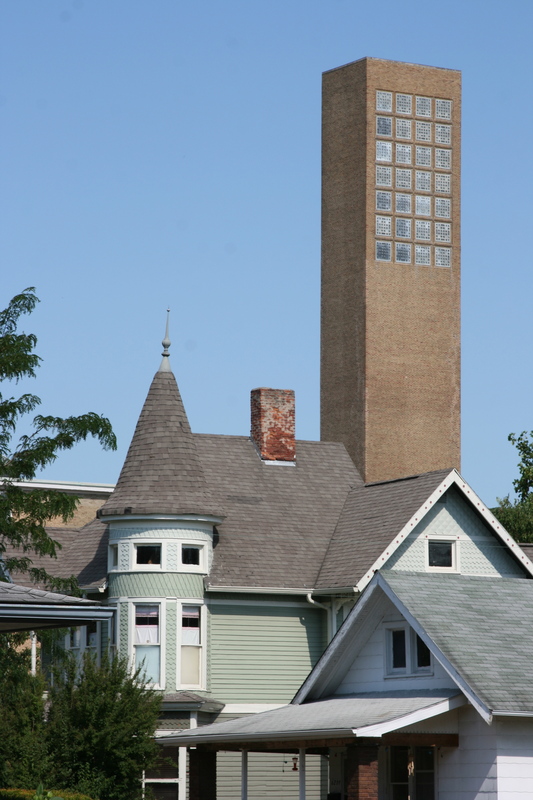 Eliel Saarinen’s First Christian Church (1942) is very large, occupying an entire city block, a sprawling complex with his signature brickwork and Craftsman-like woodwork. The building must have caused a stir when it opened, as it was unlike anything in the town at the time, and still dominates the area as the tallest structure downtown. 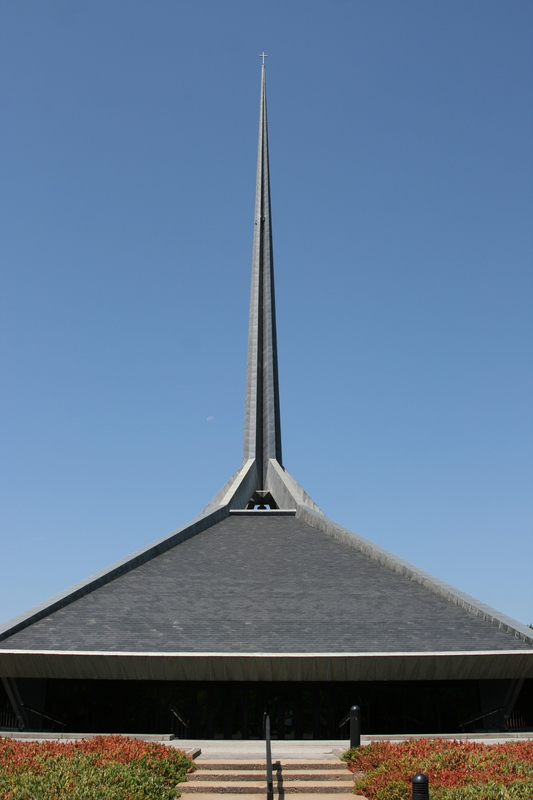 Saarinen junior’s North Christian Church (1964) soars tall, with a 200 foot spire topping an asymmetric floor plan. The interior is subdued, with this filtered oculus that didn’t quite work the way it was intended, but still hovers high above the space in a thrilling way. Downtown has stuff that one would never imagine today, for example the post office (Kevin Roche, 1970). This is no ordinary post office, it’s a rugged, brawny structure reminiscent of the Daley Center in Chicago. 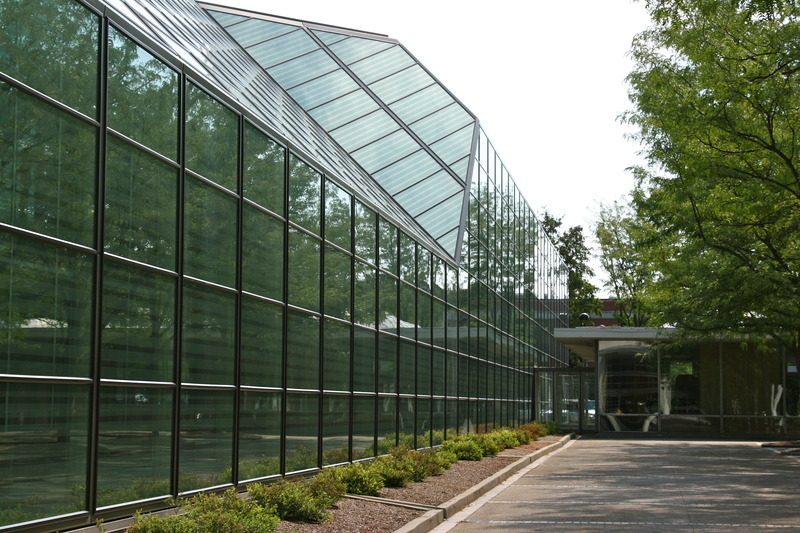 The main newspaper office (The Republic) is a clean, glassy block. Eero Saarinen’s 1954 bank building (Irwin Union Bank and Trust) is accompanied by the skylit addition (Kevin Roche, 1973) that could have been mistaken for 2003. The Saarinen building was probably the most distinguished bank structure since Louis Sullivan’s banks. And there’s a whole lot more, including buildings by Pei, Pelli, Stern, Meier, Venturi, Birkerts, distinguished public art, and all sorts of creative designs for schools, bridges, fire houses, and other civic structures. There’s also Saarinen’s Miller House, which is hidden away (but I think I’ve figured out where it is) and is open for tours, though they were sold out the day I visited. Still, given all the wonderful buildings in town, it’s hard to say how much this enhances the daily lives of its residents and workers.